Dr. Garry Brown MS, DO received his pharmacy degree from Washington State University where he also explored the area of nuclear pharmacy. He received his Master of Science in Radiopharmacy at the University of Southern California and his Doctor of Osteopathy from Western University of Health Sciences, College of Osteopathic Medicine of the Pacific. He completed an internship at Eastmoreland Osteopathic Hospital followed by an internal medicine residency at Emanuel Hospital. Dr. Brown completed a radiation oncology residency at the Los Angeles County/University of Southern California Medical Center. 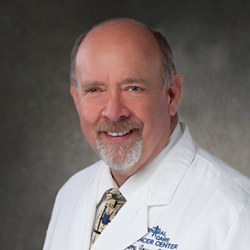 Dr. Brown is board certified by the American Board of Radiology. His practices include radiation treatments, IMRT, IGRT, precision 3-D treatment, prostate seed implants, radionuclide therapy, High-Dose-Rate, brachytherapy, radiosurgery and TomoTherapy. His professional memberships include the American Society for Radiation Oncology, the American Osteopathic College of Radiology, the American Brachytherapy Society, and the American Osteopathic Association.